For most computing tasks there is complex software, simple software and plenty in between. Trick is finding precise balance between what needs to be done and tool to use. I’ve covered some advanced tools like Process Explorer and Process Monitor but using those may be overkill at times. Specific tasks may be accomplished easier with single-function utilities. For looking up all files that are currently opened in the system that would be OpenedFilesView from Nirsoft . 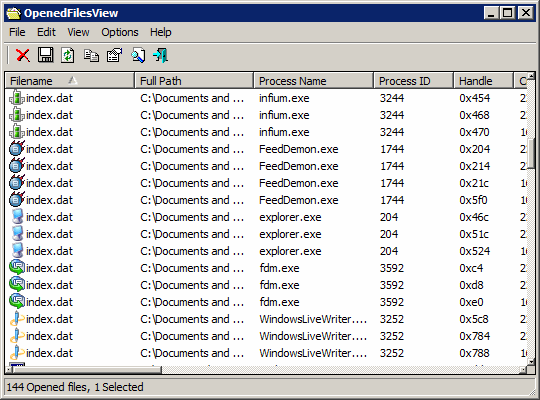 OpenedFilesView shows all files that are currently active. Aside from producing list of those it also gathers very complete information on each file including paths, dates, attributes, related processes and more. Unlike software that monitors running programs OpenedFilesView is focused on physical files. Real-time monitoring is disabled by default but can be enabled in menu Options > Auto Refresh . Like any good troubleshooting tool OpenedFilesView may look like it shows too much. Actually interface is simple but very customizable – specific columns can be chosen, dragged around and there are extra options to hide files locked by system or residing in Windows folders. If you don’t want to mess with all files but have rough idea what you are looking for then app offers nifty option of integrating in Explorer context menu. Launching it that way will only show opened files in specific folder you used it on. App is simple to use, blazing fast and tiny while providing very comprehensive information. It’s not portable but works without installation . From satisfying curiosity to dealing with malware – it’s very good at working with opened files. In addition to graphical interface there are also export options and some extras available with command line arguments (check home page for those). Great find. Will check this out. I have see tools which monitor processes but not open files. As always glad you like it. :) There are indeed tons of process monitors but sometimes looking at what is going on on hard drive is needed.